Signed Daniel Ricciardo F1 memorabilia including autographs, signed Ricciardo visors and photographic displays. Most with photo proof; all with a Certificate of Authenticity, Free UK delivery and fast worldwide shipping! Calabrian-born, Australian-raised Formula One star Daniel Ricciardo may only be 29 – but he’s already been involved in professional racing for two decades. At the age of 9 he started out on the go-karting scene in his native Perth, as many F1 drivers do. His participation in competitive events began in West Australia and quickly spread to Melbourne and later to the UK. Ricciardo then moved up through the ranks making his debut in Formula One for Red Bull in 2009 before joining Scuderia Toro Rosso. In 2014 Ricciardo joined Red Bull again, this time as a fully-fledged racing driver ready for world championship success. In his very first season he finished third overall, securing three wins in Canada, Hungary and Belgium. 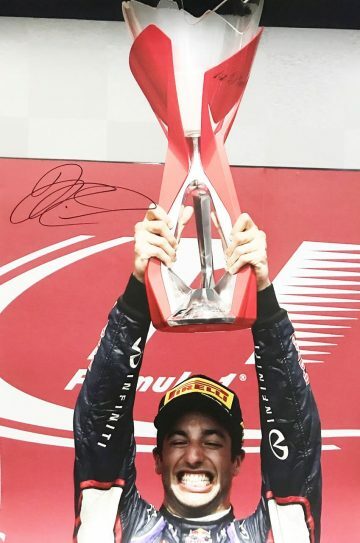 He returned in full force in 2016 to win the Malaysian Grand Prix, followed by the Azerbaijan Grand Prix in 2017 and the Chinese and Monaco Grand Prix in 2018. In August that year he announced his departure from Red Bull in lieu of a new partnership with Renault F1 Team. Our Daniel Ricciardo signed F1 memorabilia collection features unique, exclusive items signed by one of the sport’s brightest young stars. Here at Firma Stella you’ll find signed Daniel Ricciardo photographs, mounted displays and visors worn by the man himself. Browse now to uncover extra-special collector’s items and investment pieces.